Lindsay von der Luft waits at the goalpost. The senior goaltender was called into action in Northwestern’s first penalty shootout since 2006 in Saturday’s loss to No. 17 Stanford. With the Big Ten Tournament looming, Northwestern’s weekend results were mixed. After closing the conference season with a 4-3 win at Michigan State (8-11, 3-5 Big Ten) on Friday, the No. 10 Wildcats (12-7, 5-3) lost to No. 17 Stanford (11-5) 3-2 in a penalty shootout Saturday, extending NU’s losing streak against ranked opponents to four games. Friday’s win gave the Cats the No. 4 seed in next week’s Big Tens and a Thursday matchup with fifth-seeded No. 15 Iowa. Friday’s win snapped a three-game Big Ten losing streak that had dropped NU from the top of the conference to the middle of the pack and onto the NCAA Tournament bubble. The Cats managed a slight edge in shots on goal — 12 to 9 — while the Spartans earned 10 penalty corners to NU’s seven. In contrast to recent games, the Cats took advantage of their opportunities, converting on a corner in the first half and scoring three goals in a 15-minute span after the break. Junior forward Pascale Massey was instrumental in that effort, deftly navigating through the defense to give NU a 3-2 lead midway through the second half and add a crucial insurance less than five minutes later. 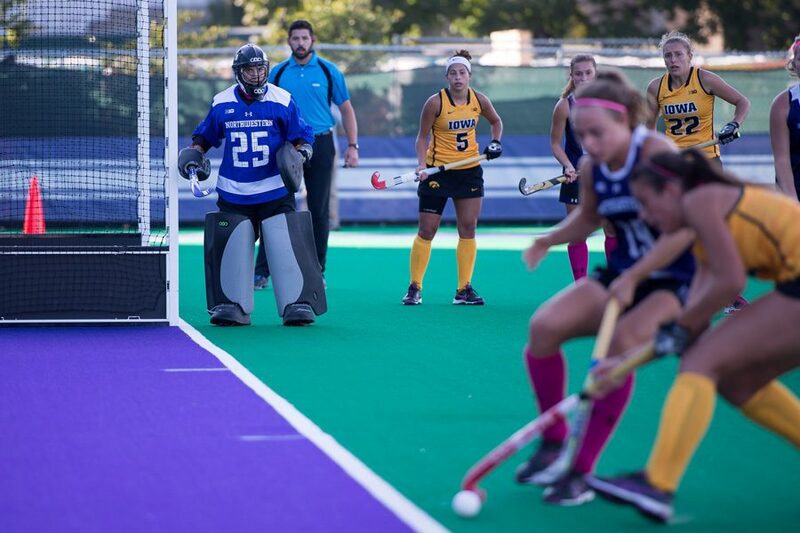 The Cats also took advantage of a penalty stroke save Friday from senior goaltender Lindsay von der Luft, who followed the effort up with eight saves Saturday. NU struggled to generate as many opportunities against the Cardinal, putting just five shots on goal and earning six corners in 100 minutes. The offense went silent in the 30 minutes of the 6-on-6 overtime, which usually allows for more attacking opportunities because of the additional open space on the field. The Cats, however, went without a single shot or corner in that span. NU also struggled in the exceedingly rare penalty stroke shootout, its first since 2006. All four shooters had their attempts saved. The loss continued a downward trend for the Cats against ranked foes. After statement wins in late September against Maryland and Penn State, both ranked in the top six, NU has gone 0-4 against top-20 teams. Two of those losses — to Stanford and then-No. 16 Iowa on Oct. 14 — came against teams outside the top 15. Nonetheless, Friday’s win kept the Cats in the top half of the conference and gave them a preferential seed. They will, however, need to break their streak against ranked opponents to defeat Iowa in the tournament’s opening round. Though Saturday’s loss was a difficult one for NU, Fuchs said it could be good preparation for postseason games.